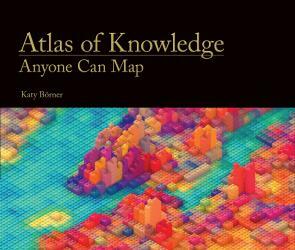 On Wednesday, 22 April at 4pm CET (10am EST), the Mundaneum is inviting Katy Börner (Indiana University) for an online Art Talk about her latest book, “Atlas of Knowledge. Anyone can map”. Her presentation of what mapping can bring to the understanding of science and technology data will be followed by a conversation with specialists Andrea Scharnhorst (KNAW-DANS) and Almila Akdag (eHumanities group KNAW). We live in “a time when data literacy is becoming almost as important as language literacy. The Atlas of Knowledge intends to empower anyone to map and make sense of science and technology data to improve daily decision making.” Atlas of Knowledge, Katy Börner, MIT Press, 2015. The Mundaneum, brainchild of Paul Otlet – the “father of the Internet idea” – and Henri La Fontaine – Nobel Peace Prize 1913, is devoted to their heritage and its translation into today’s digital culture. One of their preoccupations was collecting, classifying and sharing information, including with graphics and maps. Katy Börner (Professor of Information Science) and Andrea Scharnhorst (Head of e-Research, Data Archiving and Networked Services) both are scientific advisors for the Mundaneum exhibition Mapping Knowledge, understanding the world through data (June 12 2015 – May 29 2016). Almila Akdag works on technoscience art and information visualization. Follow the Art Talks page and @Mundaneumasbl for updates and ask questions during the live video talk on HangOut using the hashtag #AtlasOfKnowledge.